I like the cow panel hoop chicken tractors so much I thought I would try my hand at making a layer house out of them. This will solve several problems for me. Primarily, I don’t want to clean out bedding in a layer house on pasture. Also, I don’t want to use a tractor to move my layers. This design has several drawbacks though. First, it’s open on both sides. An owl could fly right in and ruin my day. Second, I have some concerns about the weather. We’ll certainly keep them in a greenhouse over the winter. Anyway, here it is. 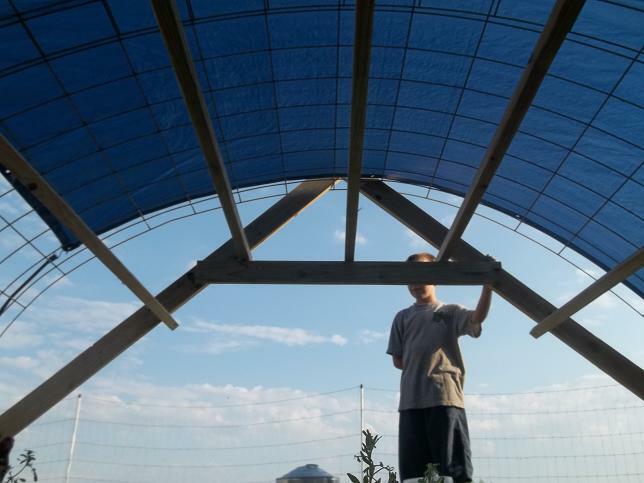 The crossed 2x4s support the hoop and prevent it from swaying. Then there are roost bars across the span. I may need to put in two more 2x4s to prevent the roost bars from drooping. 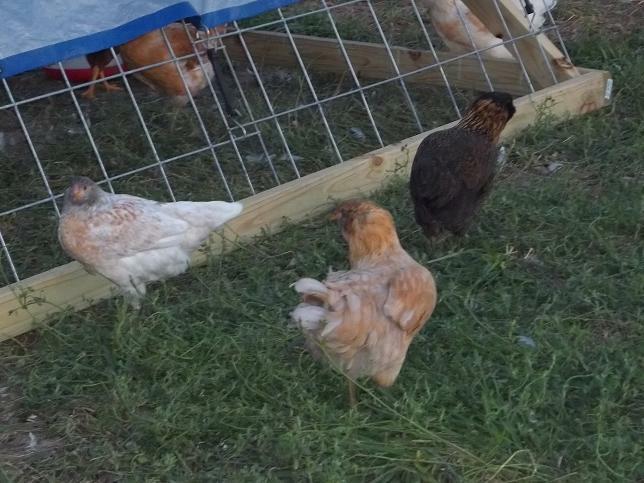 I also may need to lower the roost bars a bit as the pullets grow. Overall though, I really like it. I plan to hang nest boxes off of one side or both. For now these birds follow immediately after the chicken tractors and I move their house daily. We had a bit of a circus rounding up the pullets in the greenhouse to move them out to pasture. Everybody helped and after a little while, all birds were caught, their wing feathers were clipped and they were packed into crates for the big move to the alfalfa field. Once there, we had a good time convincing these birds they needed to roost in the structure. Oh well. Keeps things interesting. 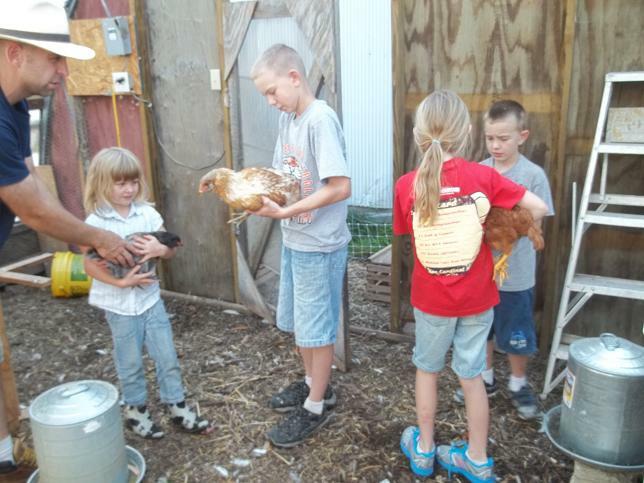 Now, it just so happens that I have a few Americauna pullets to spare. If you know anyone interested in them, please let us know. I’ll keep you posted on how the house works out. We’re two days in. So far…so good. 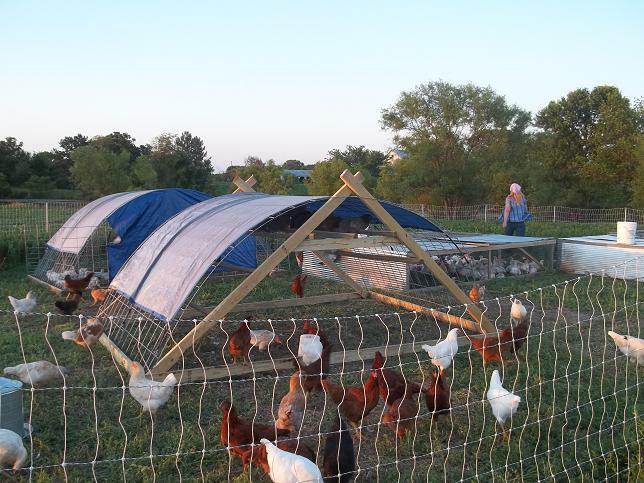 This entry was posted in Pastured Poultry and tagged Chicken House, Chicken Tractor, Hoop Chicken Tractor, Layers. Bookmark the permalink. I always think kids are the best chicken catchers going. Determined, not afraid to get dirty, and almost as fast as the chickens. I try to time planned chicken catching events for night time, when the chickens are roosting, they get so dopey then you can catch most of them without fuss. The hoop structures look good – I like the framing you’ve built for them – other I’ve seen like this don’t have it, and I always wonder what happens in strong wind. About how heavy are they? Do you put the dolly under them, or just drag them? They weigh about the same as the other hoop structures, lighter than the box chicken tractor. We use the dolly. We didn’t wait for them to roost because we wanted them to roost out there. If I just placed them on the roost they wouldn’t learn…as fast. This way we just herded them into the hoop at sunset and they did their thing. Oh I like that!! 🙂 Do you mind if I “steal” the idea and make one for my own hens? I’ve been looking for something light enough for me to pull, yet sturdy enough to withstand bad weather. Everything I’ve found so far is either too flimsy, or it requires a tractor (or draft animal) to pull. [smacks forehead]. Go to town. It’s just a first effort so I’m sure there are any number of improvements. Let me know what you figure out with it or if you abandon it for something better. Deal? Look for an upcoming post on our need to share and improve on our ideas within the community of alternative farmers while still remaining diverse and distinctive. Oh, and one thing I noticed is the birds need more shade. I would like to see Salatin’s Millennium Feathernet on a hot day just to see where the birds go to get comfy.